I’ve just returned from a two-week mission trip that provided lots of opportunity to practice giving sacrificial thanks. The first came when our flight was canceled as we waited to board. “Thank You, Lord, that this was no surprise to You,” I said. Then came that flight’s two-hour delay after boarding. “Thank You Father, that we don’t have to make another connecting flight,” I said as we sat on the tarmac awaiting take-off. Traveling home meant rising at 4:30 AM to catch a shuttle van at 6:00 AM to Budapest, Hungary. When departure time came, the driver turned the key in the ignition but nothing happened. He tried several more times. Nothing. “The battery is dead,” he said. When circumstances don’t go as we plan, we can either grumble or give thanks. Grumbling is our natural bent even though we all know it does no good, right? 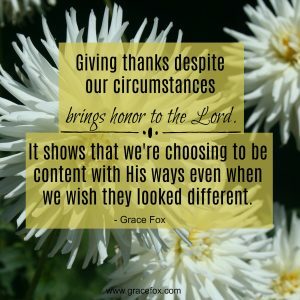 But giving thanks shifts our focus from our circumstances to the God who rules over them. It sets our mind to rest and frees us to watch with anticipation to see what God will do on our behalf. What circumstances in the past week have provided you with opportunities to give sacrificial thanks? BTW – a hearty thank-you to all who prayed for me while I was on this trip. I’m certain your prayers helped me choose gratitude over grumbling. Dear Sister Grace: It is time I sent you a note of thanks to you for your updates of your ministry opp and encouraging heart stirring emails like this one. I have always been blessed by your emails. A dear friend who is 81 & husband 90 are in difficult circumstances and just sent this on to her. I sent her lots of life-giving messages like this. I know she will be blessed. To God be praised for you and all that He is teaching you and us through you. Blessings From God’s Ever-Flowing Springs, Gladdie-Mae, “thegladgirl” !